I won’t say any more suffice to say that the story gets better and better as it progresses. I grew to understand Red. I understood her ingrained will to survive and never to be a victim. I found myself admiring this person as her tale went on. Charlotte Anne Walters has written a wonderfully enthralling novel. Threading Red’s story throughout the years beginning with the harshness of her life in a Victorian workhouse to her time on the streets, to discovering Baker Street and life beyond. It’s gritty and heart-warming in equal measure. Walters tackles some pretty horrific scenarios, making me appreciate just how hard city life was (is) if you came from the wrong side of the tracks. The book moves at a relentless pace. The depictions of Holmes and Mycroft felt very much out of character; Walters only gets away with this because Holmes, Mycroft and, to a lesser extent, Watson are very much supporting characters. Therein lies the secret to what I feel will be this book’s success. It revolves around Red rather that the canonical characters. Despite its flaws I consider it one of the best pastiches I have read for a long time. I found Barefoot On Baker Street to be a memorable story. We see life through the eyes of Red throughout the book and the reader is left in no doubt as to the gritty and harsh realities that Red faces and finds herself in, but then again being poor and without money in Victorian London was also a harsh and dangerous situation to find oneself in. Throughout the story we get a vivid portrait of the tragedy that is Red’s life and the sense of her helplessness as events threatened to consume her and dictate her future. I loved the very vivid imagery and descriptions of her childhood life, and her rise to the highest echelons of Professor Moriarty’s empire which also portrays a gritty realism of life in Victorian London and is not a story to be read by the faint hearted! Without giving too much away I must point out that I did feel rather sorry for Wiggins! Both Sherlock Holmes and Dr Watson’s lives are affected and touched by Red’s intertwinement in their lives, both with different and surprising outcomes. It is fast paced and I could not put the book down! I was up into the early hours reading it and I was enthralled by the exciting build up to the conclusion of the story! Red is such a bold and memorable character, I am reminded in many ways of Kitty Winter whom we meet in Doyle’s Sherlock Holmes story The Illustrious Client. Red shares many of her qualities. The end of the story however is delightful and I had to smile thinking Sir Arthur Conan Doyle himself would have approved of the final scenes of the story. 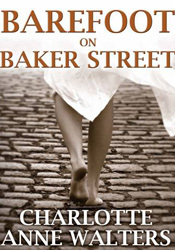 Barefoot on Baker Street is a story that I will remember for many months to come. I shall miss Red but I know that she will be waiting when I will come back and read the story again! Some may have concerns about Red, the heroine of the adventures, and her liaisons with the three main male characters which I won’t go into detail about here to avoid spoiling the plot. But all that said it is still an excellent story from a new author. It centres around the life of a workhouse orphan, Red, who ends up working for Moriarty – gets involved with Holmes and Watson, all in the familiar surroundings of Victorian Britain. Or should I say the more realistic surroundings that were much more grim than many portrayals in Holmes films. It’s a great book for Holmes fans, but just as accessible for non fans as it’s a strong novel in its own right and Red shines as the main character. As a novel, great. As a debut excellent and look forward to the next one. 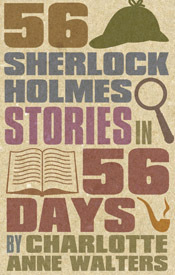 When I first started this book, I wasn’t sure whether I would enjoy it as Sherlock Holmes is not top of my wish list. However, the central character, Red, is a force to be reckoned with and her character evolves dramatically throughout the story. It gets better and better as the book progresses, with a truly authentic feel, and quite soon reaches a point where putting it down isn’t an option. There are twists in abundance and it is evident that the author knows her subject and has spent a lot of time on research. I would certainly recommend this book and look forward to more in the future. I absolutely love this book!! I am not a great Sherlock Holmes fan but you do not have to be to read this. It is addictive. From the minute I started reading I wanted to find out how the story would develop and couldn’t put it down. The central character Red has had a very tough life, enduring violent acts at the hands of others, she therefore soon learns to protect herself and those she loves. She is tough, yet caring, feisty yet endearing, no wonder even the great Sherlock falls for this enticing creature. She wants to be loved and has a great capacity to love and she will do everything it takes to protect and care for her friends. A well researched and inspiring read for anyone. Whilst not always Canonical, nevertheless this is a sterling effort. The central character is unforgettable and wonderfully drawn. It’s not quite as Holmes et all as some of are used to seeing him but don’t let that put you off . . . a worthy addition to Holmes literature. Highly recommended. Really enjoyed this – am not a massive Holmes fan but am interested in Victorian England. Now may go and re-read some of Conan Doyle’s originals. Fast-paced action. I think she is a character that you can warm to although you have to realise where’s she’s come from. Once you’ve started it’s very difficult to put down. Would definitely recommend.